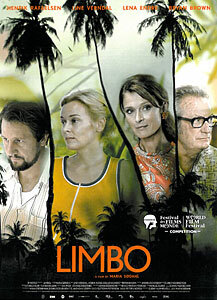 Limbo (Director: Maria Sødahl): I was initially attracted to this film because of its setting: a community of expat oil engineers in 1970s Trinidad. But quite apart from exquisite art direction, Limbo features one of the strongest performances I’ve seen in quite a while. Sonia (Line Verndal) has delayed joining her husband Jo in Trinidad to care for her mother, who’s just had a stroke. But after six months, she packs up her two young children and leaves Norway for the Caribbean. Upon her arrival, she experiences much more than culture shock. She discovers that her husband has been carrying on an affair with a local woman in her absence. Despite his declaration that it was just a “fling” and that it is over, she can’t seem to trust him, or to settle into her new life. She’s also not accustomed to having servants make her meals and clean her house, and she seems unable to slip into the life of leisure that the other expat wives take for granted. Despite the fact that her husband’s friend has a Swedish wife, she seems unenthused by the other woman’s overtures of friendship. Jo’s efforts to win her trust back also fail, and when she backs out of a trip to Houston with him, he becomes suspicious. When the children convince her to accompany their gardener on an overnight trip to catch crabs, she goes along and even flirts with the man, but it’s revenge and not lust that drives her. Before long, her discomfort grows into a full-blown nervous breakdown, and she checks herself into a monastery to “rest.” With this time to clear her mind, she makes a decision about her future that upsets the equilibrium her husband has been so desperate to establish. Though it might sound a bit like a soap opera on paper, in reality, the performances lift this considerably, turning it into a character study of a woman trapped in circumstances seemingly beyond her control. When she finally develops the strength to choose her own future, it coincides with a moment of tragedy that gives the film an ambiguous but somehow satisfying conclusion. Here is the Q&A with director Maria Sødahl and stars Line Verndal and Bryan Brown from after the screening. This entry was posted in Film Festivals and tagged #mwff10, 1970s, expatriates, norway, trinidad. Bookmark the permalink.